The best studied Cas12b nuclease from Alicyclobacillus acidoterrestris (AacCas12b) exhibits optimal DNA cleavage at 48 °C, a temperature incompatible to genome editing in human cells. The Feng Zhang lab identified a Cas12b from Bacillus hisashii, BhCas12b that is functional at 37 °C but preferentially nicks the non-target DNA strand. The lab then found gain-of-function mutations that allows it to be repurposed for double strand breaks at target sites. Caixia Gao’s lab has developed a new plant base editor from an evolved tRNA adenosine deaminase that is fused to a nicking Cas9. This base editor can be used for A•T to G•C edits in protoplasts or plants of rice and wheat. In 2016, Jonathan Ploski’s lab developed a viral mediated genome editing system that could be regulated by doxycycline. Now, they’ve developed another AAV toolkit - this time using the Staphylococcus aureus Cas9 (SaCas9). This AAV-based genome editing system is regulated not only temporally with doxycycline, but it can also be regulated spatially with Cre-recombination. String assembly gRNA cloning (STAgR), developed by Stefan Stricker’s lab, is a single step gRNA multiplexing system that generates vectors containing high numbers of gRNAs in one overnight reaction. STAgR is highly customizable as vector backbones, and gRNA structure, numbers, and promoters can all be chosen. Carol Gross’s lab recently deposited “Mobile-CRISPRi” plasmids, a set of modular CRISPRi tools that can be used in diverse bacteria from various environments. It has the advantage of stable genomic integration and is easily transferred via conjugation. Using a bioinformatics and a screening approach, the Jennifer Doudna lab identified three different Cas12a inhibitors. Some of these anti-Cas12a proteins have broad inhibitory effects on Cas12a orthologs and can block Cas12a-mediated genome editing in human cells. Valcyrie is a CRISPR-based marker excision method for marking distinct cell clones developed by the Michalis Averof lab. It’s an alternative to the conventional Cre or Flp recombinases used to excise markers. It has the advantage that CRISPR efficiency can be controlled by manipulating complementarity between the gRNA and target. 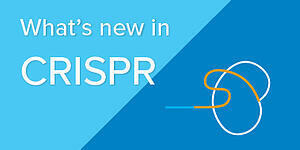 If you have a new CRISPR tool you’ve recently deposited to Addgene and you’d like it to be included in the next What’s New in CRISPR blog post, please let us know!